On Sunday, June 23, 2018, Turkish President Recep Tayyip Erdogan was re-elected to the Turkish presidency and secured a parliamentary victory. The Center for Preventive Action (CPA) interviewed CFR’s Senior Fellow for Middle East Studies Henri J. Barkey to discuss what this victory means for Turkish foreign policy in Syria and, domestically, what it means for Turkey’s Kurds. For more on the ongoing civil war in Syria and the conflict between Turkey and armed Kurdish groups, follow CPA’s online interactive, the Global Conflict Tracker. What does Erdogan’s re-election mean for ongoing conflicts in the Middle East—particularly in Syria— and attempts to reach peaceful resolutions? Erdogan has two reasons for wanting to return Syrian refugees to Syria: (1) the results from the last election indicate that some Turks are unhappy with the presence of so many Syrian refugees in Turkey and (2) scholars have predicted that an economic crisis is imminent in Turkey. The Syrian refugees pose two problems for Erdogan. First, there is a perception that they take jobs away from Turkish citizens. If the Turkish economy was booming, that would not be a problem, but if the economy starts to contract—as is expected—it becomes a problem. Second, hosting refugees costs money. So, as he has mentioned in the past, Erdogan will move the Syrians to Afrin. He has already established school systems in Afrin and has reportedly even opened branches of some Turkish universities. Turkey has made an effort to build up that area and the only reason to do that is to move the refugees there. He was not going to do anything about this until after the elections, but now he has a free hand. The big question, is what happens if there is a major Syrian offensive against Idlib? Iran, with Turkey and Russia, have created checkpoints to protect Idlib, but, frankly, sometimes Assad will do things that even the Russians don’t want him to do. So if Assad attacks Idlib, does that also create a new refugee problem? There are also number of armed groups that are close to Turkey in Idlib. What does Turkey do? It is possible that Assad’s army is tired and in need of a respite, and so they will not do anything in Idlib for the time being, but at some point he will. He will want to control his own territory. Of course, underlying all of this is the fact that in Syria, for Erdogan, the main preoccupation is not Assad and the uprising against Assad, but the Kurds. He really wants to defeat the Kurds there. What does his re-election mean for military operations against Kurdish groups in northwest Syria and in Iraq? In Iraq, Turkey, Iran, and the Iraqi government sided against the Kurdish Regional Government (KRG) referendum last year—and Turkey helped the Iraqi government capture territory, like Kirkuk, from the KRG. The KRG had been recognized as legitimate by Turkey and continues to be an important trading partner; oil from the KRG is piped through Turkey to the Mediterranean. However, another Kurdish group also operates in Iraq: the Kurdistan Workers’ Party (PKK), a Turkish group. The PKK has its headquarters and several bases in the Qandil mountain range near the Iranian border. Before the elections, partially as an electoral ploy, Erdogan sent his military to attack the PKK’s mountain hide-outs. Turkey did achieve some success, from what I can tell, but the truth of the matter is that it is very difficult for a conventional army to go up into those mountains and achieve significant, decisive results. Even in the 1960s, when the Iraqi government was fighting Kurdish forces, U.S. government reports assessed that Iraqi forces would not be successful in forcing the other side to sue for peace. If the Iraqi government could not do it, it is highly unlikely that Turkish forces could, even today. Turkey is far more sophisticated now and has more sophisticated weapons, but it is not their territory—and they cannot even control all of the Turkish territory. The important thing about Syria and Syrian Kurds is that Erdogan turned on them in 2014, when Kobani [a city in northern Syria] was attacked by the [self-proclaimed] Islamic State. Erdogan did not want the United States to defend the Kurds in Kobani for the very simple reason that he perceived what was happening in Syria as a duplicate of what happened in Iraq. That is, the United States intervened and, with that intervention, created a new federal arrangement. That scared the living daylights out of Erdogan because he thought the United States would do the same thing in Syria. Maybe the United States wouldn’t have done that—it may not have been part of the plan—but it could have ended that way. From Erdogan’s perspective, you had a federation in Kurdistan and a federation in Iraq. And what would happen next? A federation in Syria. After passing the 10 percent threshold to enter parliament, will Turkey's People’s Democratic Party (HDP) be able to effect change for Turkey’s Kurds? Crossing the 10 percent threshold is psychologically important, but it is not as important as it could have been had the governing coalition lost its majority. Essentially, the Turkish parliament has been reduced to a tea club. It has almost no powers and all power is concentrated under the president. So, it doesn’t matter how many deputies each party has in parliament. The victory for the Peoples’ Democratic Party (HDP) came, in part, from the support of many Turks who do not support or belong to the Justice and Development Party (AKP)—and that is actually quite important, but it is not going to change the future of the Kurds in Turkey. Because of Syria and the Syrian Kurds, Erdogan has taken a very hard line domestically. The leader of the Kurdish opposition party is in jail and has been for many years now. The charges are ludicrous, but so are the charges against most people in jail in Turkey. The real problem is Erdogan’s strategic ally, the Nationalist Movement Party (MHP)—an extreme radical, right-wing party that actively dislikes and acts against the Kurds. Erdogan does not have a majority in parliament—and you could argue that does not matter—but he has an alliance with the MHP. 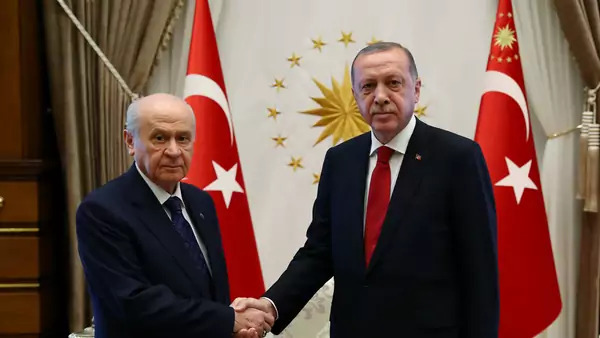 It has been suggested that Erdogan might want to be magnanimous after his electoral success and will re-start the peace process, but that is extremely unlikely because he will not want to start a fight with his allies in the MHP. Furthermore, while the MHP won 11 percent of the vote, the Good Party—an offshoot of the MHP which is no different when it comes to their policy toward the Kurds— won almost 10 percent as well. Between the two, approximately 20 percent of the population voted for radical, right-wing parties. We know that the MHP and the Good Party are philosophically, ideologically, and politically opposed to any concessions with the Kurds. I would be very surprised if there is any attempt at reconciliation at any time soon. Something else, somewhere else will need to change in order for Erdogan to restart the peace process—and he can do it because he has done it. At the moment, it is not worth messing with the alliance. He will continue to worry about the two right-wing parties. At this stage, he can manage the Kurdish issue as it stands and will use Afrin to absorb and relieve the pressure from the refugee problem. For Erdogan, right now, the economy is the real, domestic threat to his power.